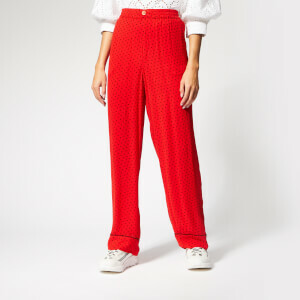 The Stine Goya 'Lana' jumpsuit hails from the label's 'NOTHINGNESS' collection, a range heavily influenced by director Michelangelo Antonioni and Italian fashion from the late 1960s. 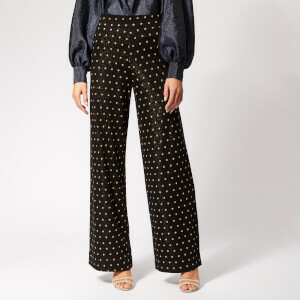 Cut from soft viscose-blend fabric, the wide leg jumpsuit is elevated with a woven gold dot print; a design inspired directly by a pattern worn by Monica Vitti in one of Antonioni’s movies. Designed with a collared neckline, button down front and self-tie waist belt to create a cinched-in silhouette. Finished with long sleeves and buttoned cuffs.